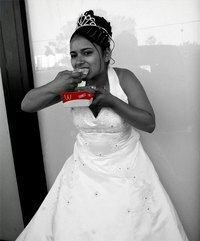 Food is important at a quinceanera, especially the cake. For Hispanic teen girls, their 15th birthday--marking the year they become young ladies--is a celebration filled with tradition and rites of passage. The family throws a party, the young lady dresses like a princess and all her friends and family, including her Court of Honor, gather to congratulate her. The event is in the planning stage for months--even years--and food, especially the quinceanera cake, is central to the entire celebration. La Quinceanera, Spanish for "15" and "age," originated with Mexico's pre-Colombian Aztecs some 400 years ago and spread to other Latin cultures, including the United States. Some American families meld Hispanic and American traditions by throwing a quinceanera-style gala for a Sweet 16 birthday. These can include all the quinceanera traditions -- the Court of Honor, religious ceremony, waltz, ceremonial changing of flat shoes for high heels, reception and a tiara with the number 16. Central to the celebration is food for friends and family, whichever year it's given. Food can be a large part of the expense, but if you prepare your own food and bypass the caterer, you can save your budget for other things. Even if you lack time to cook yourself, local delicatessens or supermarkets package pre-made hors d'oeuvres and canapes. Perhaps the birthday girl has a favorite restaurant. Talk to them and get a price for supplying her favorite dishes for your party. When planned in advance, they can deliver on time and you can keep dishes warm by renting warming trays. Food ranges from simple to sumptuous. Traditional foods popular for La Quinceanera include different types of enchiladas, rice and beans, corn-wrapped tamales and a variety of tacos. A barbecue or a fajita buffet are also popular, whether catered or made by the family. Mole, a chocolate sauce used for a variety of dishes, cabrito, a roasted goat dish from Monterrey, picadillo, ground beef that can be eaten alone or used in tamales and tacos, and pan de polvo--a special sweetbread--are traditional crowd-pleasers. Quinceaneras choose a theme for their special birthday party, based on their favorite movie, hobby or interest. These can range from a traditional princess to an adventurous disco, and the costumes, decor and food are picked to match. Examples are chili, chips, guacamole, stuffed mushrooms, tuna salad and cocktail wieners in barbecue sauce for a '60s theme. A luau with sushi, fresh pineapples, macaroni or potato salads, barbecue ribs, egg rolls and teriyaki provides nontraditional fare for a fun celebration. Traditional food at a quinceanera ends with a fancy cake, usually decorated to match the theme. Whether created by a family member or a local bakery, it normally has a doll on the top. Many quinceanera cakes have staircase winding up the side. Seven dolls line each side, as if a court of 14 were climbing up to the main quinceanera doll as a symbol of the last childhood toy. Elaborate cakes might have a fountain cascading down the side. Other traditional desserts include arroz, a creamy rice pudding, or sweet pan de polvo, Mexican shortbread flavored with anise and cinnamon.